I received this book as part of a blog tour promotional for N. D. Wilson's latest book, Death By Living. I was expecting DBL in the package, I was pleasantly surprised by Tilt-A-Whirl (henceforth referred to as TAW). But if you read my blog regularly, you know this already. I know N. D. Wilson refutes the idea that he writes with a stream of consciousness style. I don't know if that's because people use it in a derogatory manner—I certainly do not use it that way. When I refer to stream of consciousness as a style I truly mean that, it is a style, it is intentional. It is supposed to make you think twice (2x) about what you just read, just to make sure you made the connections the way the author has. I find it beautiful and powerful and, as a result, effective. I do not mean to say that N. D. Wilson writes haphazardly or recklessly, I have always maintained that this is a beautiful style. That being said, I give the book 4 out of 5 stars for technical merit. It was very beautifully written and flowed nicely. While the book was loosely based on the marvel of God's creation, it felt more like a collection of essays than a full work that dealt with one topic. This is not a negative critique, it is an observation of the organization and layout of the book. N. D. Wilson poetically describes the strangeness of the universe we find ourselves in and creates a strong case for design based on these observations. This is the age-old concept of in the world, but not of it. We should be aware of the way the world works. Doubtless, Wilson had C. S. Lewis' Aslan in mind when writing these pages. Aslan, the lion who is good but not safe. 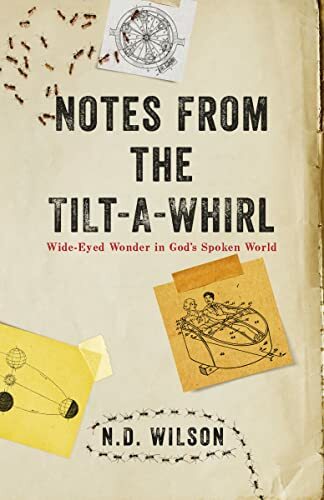 Aslan, a picture of the God who created this Tilt-A-Whirl, whacky universe (N. D. Wilson gets into specifics on just how crazy this universe was designed) is also insanely interested in directing your life's story. I certainly would recommend this book to anyone who enjoys having their brains stretched a bit. I also recommend it to people who like their prose with a side of poetry, as N. D. Wilson certainly provides that with pleasure. If neither of these appeal to you (not to mention the stream of consciousness style), look elsewhere. I have mentioned that I received this book free of charge. I was not asked to write this review but I did it anyways because I like to review books. I'm not being payed for these services though I would love to be. Call this a disclaimer if you will, but that is the truth.